This entry from Christopher Robichaud at Big Questions Online represents some of the major discussions that academics and others have when considering what superhero narratives have to give us. Spider-Man, like other characters, is prime material for philosophical debate and indeed, colleagues of mine, Rob Weiner and Alec Hosterman have postulated characters such as these exist in a hyper-realistic state. Robichaud contemplates what is the best choice for Peter Parker to make. Imbued with super-human powers, Parker must decide what will affect the greatest amount of "good" for society: to be Spider-Man or to be himself, student/scientist/dorky boyfriend to Mary Jane. It's a circular conversation the character has had with himself time and again over the years and really, a central element to his character. For those unfamiliar, Spider-Man is really formed in the center of the moral quandary so many of us face at some point: Use my potential or waste it. Shortly after Parker gains his spider-like abilities, he enters into wrestling; he wins a match but the manager stiffs him on the pay. When the money is stolen by a criminal, Peter Parker does nothing. The same criminal during his escape goes on to kill his Uncle Ben (the man who delivers the classic line to Peter Parker, "With great power, comes great responsibility"). And with Ben's murder, Peter Parker beomes Spider-Man. There are other means of looking at Parker's quandary as well. Parker becoming a wrestler could be seen as him acting as a self-interested capitalist. He's specialized in something particular and seeks to use that to his economic advantage. When the money is stolen, and he doesn't act, it is in part, revenge on the manager, but it's also a clear act of non-motivation; the "not my problem" syndrome. That is, to some degree, Parker up to this point, is a mercenary, pimping out his powers for his direct benefit. But Ben's death turns him into an altruist; risking his life and limb (and others) to protect humankind without evident gain. He's not directly gaining from his efforts and continually negatively affected by it through his lost of loved ones (Gwen Stacy) and the repeated threats towards his family. In fact, he's putting his energy and resources into something that has no direct benefit, but rather benefits society at large. He protects strangers he and provides an overall sense of safety in New York. That’s right; that red he wears pegs Spider-Man as a socialist! When we talk about characters like Spider-Man and others, who have been writ large across our cultural landscape, we realize that they tap into a great deal of our cultural discussion. We consumer them in a many great different forms: comics, video games, movies, cartoons, as cereal (literal consumption), on underwear and a myriad other ways. They provide a means of representing inner-battles in larger-than-life ways. By contrast, we have the Tony Stark/Iron Man dialogue. In this discussion, Stark as capitalist continues to benefit financially from the technology he develops for his Iron Man suit. In this serpentine loop, Iron Man is Stark's body guard; so Stark pays Iron Man (himself) in essence with money gained by the technology, which Stark also uses upon himself (as Iron Man). Thus, Iron Man becomes more improved and so does Stark’s business interests. He becomes the embodiment of perpetuated self-interest. Every win as Iron Man brings Stark profits by proxy since it continues to show off the technology. What other super-heroes offer insights into this discussion? There’s much to be said about superheroes and their explicit ideology; but what about their implicit ideology? By their approach to being superheroes what kind of dialogues about the nature, use, and abuse of power do we see represented? While comics often are the source of what many accuse of being “mindless entertainment”, a deeper look into the story line and into the heroes of this graphic novels shows a lot of depth and deep implicit meanings to the work. If Spiderman is socialism, and Ironman is capitalism, the anti-hero Deadpool is an anarchy. When the name Deadpool comes up in conversation amongst comic book fans, often it is referencing one of the simple pleasures in reading material with Deadpool in it. He is the morally-ambiguous figure that fans love due to his humorous tendencies to break the fourth wall and general comedic banter, and draws in fans with his simple minded outer image. Behind this simple entertainment is a dark backstory though, full of pain from the actions of others. Deadpool was once Wade Wilson, a man dying of cancer so accepted an offering from a seemingly friendly source, a U.S. government run program called “Weapon X”. When the experiment failed, leaving Wade Wilson scarred and mentally unstable, the government tossed him away as trash into a prison instead of working to heal him. Wilson was able to struggle on his own to beat the system and escape, using his new powers that kicked in to become a mercenary. By becoming a mercenary, Wilson transformed into Deadpool, the anarchist. Anarchy is, by definition, the act of having no authority figure and fending for oneself. Deadpool holds true to this ideology through his work, and his wavering loyalty which can immediately be bought out. Deadpool works for no one unless it benefits himself, and works by a system that no character can understand or follow. Anarchy is also an ideology like no other system of government, because it is a paradox. It is the government system with absolutely no government system. Thus, while the immediate use of Deadpool is for comic relief and parody gags with pop culture references, the internal workings of the character demonstrate Anarchy in practice. Super-villains add much to the discussion as well. They too have their own ideologies that add to the story of a super-hero. Many times, these ideologies are made to counter those of the heroes they seek to destroy. Magneto of X-Men is one example. As a Jewish child, Magneto was forced into a concentration camp and his family was killed by the Nazis, simply because they were “different”. This is obviously more than any child should have to deal with, and most would assume that after experiencing such trauma and torment, one would be changed for the better. However, Magneto chose the path of becoming a Totalitarian, much like Hitler. Magneto had watched people sit idly by and talk about what must be done, but had decided that words did not work. He had seen words fail against armies, and as the “mutant threat” became prevalent in the world, he would not join with Professor X to see words fail again. Because of what he went through as a child, Magneto was terrified of being persecuted for having a mutant power. He was born that way (the same as he was born into a Jewish family) and tried to be proactive in terms of fighting off a mutant holocaust. He enlisted mutants to his side, and promised them that they would have freedoms when he ruled the world. Humans would be killed or enslaved or perhaps he would even put them in camps similar to the ones he had to survive in. Any mutants that sided against him would perish as well. This is similar to the resistance groups during the holocaust; if you weren’t with Hitler, you were against him. Magneto is sure that his dream will come true, in which he will be the dictator over a world of Homo superior, while the Homo sapiens are wiped out. He is convinced that he and other mutants are superior to the normal humans, that they are the next stage in evolution. This has strong parallels to Hitler, in that both see a group of people as inferior and feel the need to dispose of them. Over 500 issues later, Magneto has still not reached his goal of wiping out Homo sapiens and ruling a world populated by mutants. He has been forced to face the X-Men countless times, which resemble the Allied Forces of WWII (fighting for justice, tolerance, equality, etc.). Through the many trials that he has faced, and the times that he has wavered from his position, Magneto continues to hope for a world in which mutants are the majority and where he is their leader. Every superhero represents something greater than what they are at a first glance. I believe that is what truly defines them. They take a burden to change society upon themselves, and, in this way, they become a power of nature, warning wrongdoers to beware lest they become a target and protecting those that cannot protect themselves. Keeping this in mind, Batman presents a distorted representation of this foundation of ideology. Sure he beats up baddies and saves hostages at gunpoint, but he does not necessarily offer reassuring nods or hopeful speeches that would inspire others to take up the cause like Captain America or Superman. He is wishfully alone. He is a conscious martyr. He wants all the pain and suffering and burden of singlehandedly fighting crime, but is this truly the most efficient way of using his genius-level intellect, mastery of martial arts, and especially the nearly bottomless Wayne family fortune? Bruce Wayne could easily donate millions to the Gotham Police Department to gain the resources to weed out the corruption and have the same high-tech weaponry Batman has. He could even open up several dojos teaching youth how to defend themselves, effectively starting up a patrol of young Robins. Yet he does not, and he effectively becomes nothing more than an enabler vigilante. The only person that truly benefits from the corruption besides the criminals is Batman himself, as constant crime fuels his ego and acts upon his own personal emotions toward his unresolved feelings of his parents' deaths. If he truly wants to make himself obsolete , he must stop being selfish and allow many others to help. 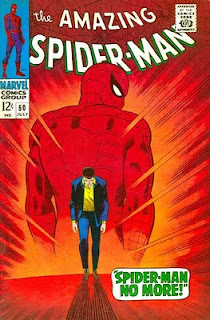 While it can definitely be argued that Peter Parker goes from representing a capitalist mindset to something more akin to a socialist mindset, could it not also be argued that he still represents the idea of the self made man which is so often touted as being able to occur in a capitalist society and to never be able to occur in a socialist society? He rises up out of the masses of humanity to become one of the few who can alter the lives of the many through his force of personality and will alone. This is a running theme throughout superhero comics. While superheroes do often exhibit the ideas and ideals of socialism where they save the many at the expense of themselves, they also represent the idea of a self made man who takes his own life into his hands and, often through nobody’s help, forges his own destiny. So, while they on the one hand throw the idea of capitalism into the wind by using their powers for the good of the communities around them rather than for the good of themselves, they strengthen the idea that through hard work and perseverance one can rise up in the world and become somebody of importance and power. I never looked at comic book heroes like this, but now that the idea is brought up, batman can fit into this new way of looking at things too. His business that is fueled by inheritance that he received when his parents were killed, also fuels his almost endless amount of money for his gadgets. If his parents were never killed, he wouldn’t have the money to run his own company or the revenge that he needs to stop criminals. This is one of my favorite things about him. Without his money, he would be a regular guy. With his money he is an unstoppable force that can stop almost any and every bad guy. Thinking about which government he would be, he would probably be a capitalist. His money benefits his crime fighting, and his fighting gives him motivation to keep the business alive so he can keep fighting. With his character being so dark, there is a lot of room for abuse of power. Despite all the power, he does not abuse it. Most rich people would use their money for themselves, but he uses his money for the good of the community. Batman is a lot like the bailout for Gotham City. The police needed help and Batman came to help everyone in need. I watch Smallville. I know it isn't the best translation from comics to television ever made but it is better than nothing. Throughout this final season, season 10, there has been a lot of politically charged action. Gordon Godfrey, a conservative radio host, has his body taken over by a dark force foreshadowing the arrival of Darkseid. Dark Godfrey starts spewing hate speech towards costumed vigilantes such as the Blur (Superman) and Green Arrow. Lois Lane discovers that Godfrey has proof of the real identity of Green Arrow and quickly warns Oliver Queen of Godfrey's plan. Instead of trying to stop Godfrey, the very Liberal Green Arrow decides that it is time to unmask himself. He does this on television to announce to the whole world that indeed, the billionaire play boy risks his life protecting the citizens of Metropolis. This story arc obviously mirrors the political environment in the United States today. The verbal attacks between the conservative and liberal media is bordering on absurd. Extreme opinions draw ratings as evident with channels such as Fox News (Conservative) and MSNBC(Liberal). Gordon Godfrey from Smallville is the mouthpiece of the extreme Conservative view. Oliver Queen represents the Liberals. Godfrey preaches that costume vigilantes should have to literally show their face. He offers no trust in the fact that these anonymous people are going to protect the people of Metropolis without incident. He wants accountability and transparency. Green Arrow, showing that he has nothing to hide, unmasks himself on national television. This interaction between Godfrey and Green Arrow is a direct commentary of the American media today. After reading both the post, and these comments, I realize now that Batman DOES infact fit into almost the same category as Stark, having all of his vigilante endeavors fueled, and somewhat DEPENDENT, on his capitalist success. Think about it, if Wayne Enterprises stopped making money, Batman wouldn't be able to repair his own car. Trust funds run out eventually when nothing is replenishing them. In this way there is almost an implication towards the importance of capitalism. I suppose it could be argued that Spiderman is a socialist, but if the reasoning behind it is fueled mostly by the fact that he does selfless things for the good of the order, the theory falls apart a little bit, especially if the only contrasting point brought up is Iron man. In Batman, no one KNOWS that Wayne Enterprises is responsible for the technology of the masked vigilante, therefore none of Batmans acts as a hero are mutually beneficial, as they would be with Stark. Batman is running about saving Gotham, Bruce Wayne is making gobs of money off of the ecomomy. To the common Gotham resident, the two are mutually exclusive. It isn't exactly possible that Batman could be a socialist because he sacrifices himself for the greater good, but Bruce Wayne is a self-benefiting capitalist jerk. They are one in the same, and can not really be both. From mmy strange perspective, this conclusion falls apart a little. I must say I've never really thought about Spider Man like this, but I must say his personality alone proclaims a capitalistic self interest. For instance him wanting Gwen Stacey, Mary Jane, and other love interest display his individualistic capital ideals. Also when Peter Parker longs for Aunt Mae to live safely and he protect her at any chance he can get displays a unfair non socialist protection to his family that some regular man or women may not receive. In addition Peter Parkers Spider Man uniform displays him as a individual that stands out above all the other citizens thus making him a separate social entity of substantial power over the bourgeois and the proletariat. His powers, ideology, and actions alone also seperate him from any other average or common social status. Yes he may work for the people, but he isnt one of them. Isnt that what makes Spider Man a superhero? He can't possibly be a social warrior if he has qualities better of that of an average human. In order for it to be proper socialism his powers would be distributed to everyone in New York. You're mailman would be shooting spiderwebs from his wrist. Although the argument his compelling, I really don't think Spider man is a Socialist because his power alone and entity doesn't fit the definition of true socialism. Just because Spiderman fights crime for the greater good does not make him a socialist. Superheroes act the way they do to rid the streets of crime and let people live their lives. Socialism is where the state and it’s political systems have ownership of all the capital. This is all based on money and many Superheroes do not fight crime for political reasons (most of the time) . Spider-man's entrance into crime could also be looked at in a similar light to that of Batman’s. Peter Parker’s uncle Ben was killed by a criminal and then Ben gave him the powerful line "With great power, comes great responsibility" and this made him use his powers for good. This could be interpreted as now he fights crime for the common good, or that he is acting out of revenge. While Bruce Wayne said that he was fight crime out of vengeance, Spider-man could be acting this way without saying. He feels much worse for his uncle’s death, because he could have prevented it. Bruce was a very small boy when his parents were murdered, and it was very likely he could have saved them. Following that logic, Spider-man should be fighting with a greater sense of vengeance. His self hate for letting his uncle get shot is just more fuel to Parkers fire that drives him to fight crime. Few of the popular superheroes fight crime solely for “the greater good”. Many are driven by some sort of revenge, or external factor because that is how most humans work. I think trying to say that anyone person is either capitalist or socialist is very difficult to do. Even though Peter Parker may not be making a profit for his powers he could just be doing something that he feels is right he has powers no one else has and not using them is a waste or maybe he is too humble to be the center of attention like Tony Stark. One character that i can think of that can't be capitalist or socialist is Batman, Bruce Wayne. Bruce Wayne has a very successful money making business which makes him a capitalist. On the other hand as his alter ego batman, he goes and saves the public from the criminal world, for no financial gain. This means batman is a socialist. I do not think many people would like to think of any American superhero as a socialist. I don't think that it was the intention of the authors to make them so, I believe the intention was more to show that there is good in people and not everyone uses their powers or abilities for criminal activities. So saying that a hero is socialist because he does not gain any money from it is not enough. Vigilantes also contribute to this discussion as well; an example of this is Batman. As you see in Spiderman, Batman uses his abilities for his own benefit. Unlike Spiderman Batman never received his powers through radio active materials, he created his powers through high-tech weaponry. Batman has a capitalist ideology that of Tony Stark. For example Iron Man and Batman benefit financially from the technology of Wayne Industries and Stark Industries. The benefits of Wayne Industries are similar to that of Stark Industries. Wayne Industries becomes the biggest power house in Gotham City. While Spiderman wrestles with the decision whether or not to use his potential, Batman decided at an early age, after the murders of his parents, to be a vigilante. Batman uses his phobias of bats, and traumas as a way of self-empowerment. As time goes on, Batman uses his abilities for the greater good of Gotham City. As you see in Spiderman, Batman also has an inner-conflict of whether or not to be Batman or Bruce Wayne. As we see with all super-heroes, their inner conflict is intertwined with the safety of the women they try to protect. Batman has to overcome many trials to be as gifted as many of the other super-heroes whose powers were given to them by other means than technology.